We’re all familiar with what zombies want to eat, but has anyone tried feeding them something else? Burgers, perhaps? The PixelJunk people at Q-Games give it a try in their first virtual reality game, Dead Hungry, and it works like a charm. Who knew? In Dead Hungry, available for the Oculus Rift and HTC Vive on Steam, you play as the world’s most put-upon food truck cook. An undead horde approaches, and it’s up to you to cook burgers and other fast food fare to sate their ravenous hunger. Serve them well, and they will revert to their human form. Leave them waiting too long, and they’ll return to their brain-eating ways. They’re mainly about burgers, but while you’re waiting on the grill you can delay their shambling advance with french fries, pizza, soft drinks and more. 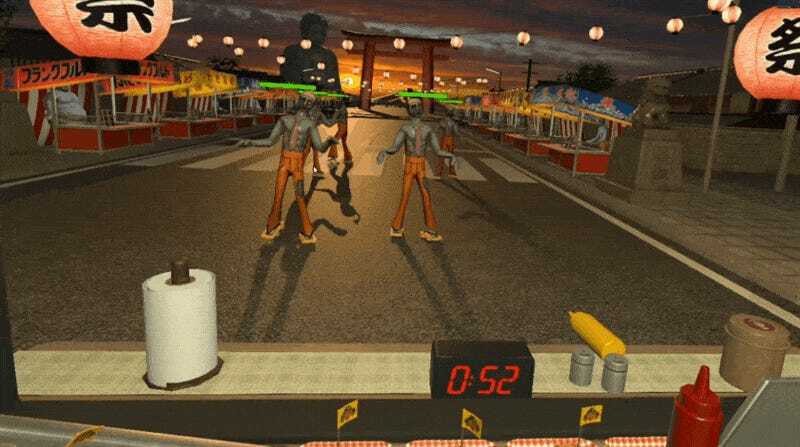 It’s basically Diner Dash meets Day of the Dead, and it works incredibly well, thanks in part to the excellent motion tracking. As you can see in the video atop the post, the action gets very frantic, and if the game couldn’t track those rapid movements, it would all fall apart. But it tracks my Oculus Touch controllers like a boss, watching them even when the ingredients I am reaching for are off camera. The whole affair is incredibly intuitive, and it only takes a level or two before you’re no-looking lettuce like a champ. I am so hungry right now. Luckily this is a standing game, and I burned a lot of calories playing. The other thing that makes Dead Hungry work so well is the environment. Placing the player inside a food truck is a clever way to get around play area limitations, and Q-Games has filled the inside with tons of little things to fiddle with during and between rounds. If you’re going to be stuck somewhere during a zombie attack, I can imagine worse places. This is now the shrimp drawer. Hello, shrimp drawer. The full version of Dead Hungry features a ton of levels, different undead enemies to serve and plenty of neat little secrets to uncover by fiddling about with things. There’s a free Steam demo available as well, so you can try to fry before you die.